What Is Causing The Bumps On My Tree? Have you been noticing abnormal growths on the trunk and branches of your trees? They could be galls, which are simply abnormal growths that occur on leaves, twigs, or branches. Identifying which type, however could pose a difficulty to someone who is not a certified Arborist as there are over 1500 different gall producers. Not all of these are cause by disease, however most of them are cause by insects and mites. The actual gall itself is produced by the tree in response to the egg-laying of mites and other insects on the tree. As the insects lay these eggs, they begin the process of plant growth hormones that produce abnormal cell growth, hence the galls. Just as a fungus, galls come in all different shapes, sizes and colors. These large growths can be disturbing to look at, however usually do not pose a threat on the tree. However, there are a few different diseases that are very harmful and could potentially kill the tree, such as black knot galls and Fusiform rust galls. Leaf Galls - You may have noticed irregular bumps on a leaf and thought they were carrying insect larvae, as it appears. In fact, by the time you have noticed these bumps these insects have moved on. They are just the result of the feeding of insects or mites, spiking this bumpy response from the leaf. As these protrusions aren’t pretty and might look harmful it is best to just let them be. If you notice them year after year this might signal a spraying is needed to keep the insects away. All of these are different sizes, shapes and colors and can be caused by different hosts. The good news is none of these will seriously infect your well established trees. If the trees are heavily infected by these galls, the most damage you might notice is some leaf drop or stem deformities. Black Knot Galls - primarily only infect plum and cherry trees but can also affect other fruit trees such as apricots and peaches. 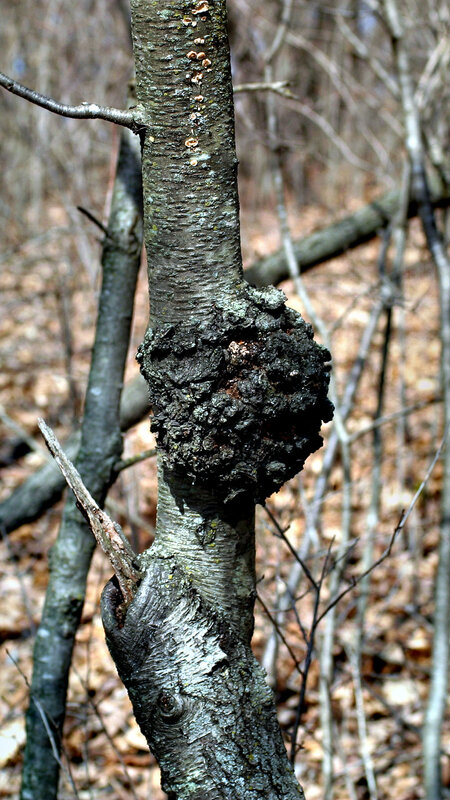 Black knot can be managed by a certified Arborist with some heavy pruning and disposal of the fungus it self but does not guarantee its survival. Fusiform Rust - This specific disease is usually exclusive to Loblolly and slash pine trees but Oak trees are the alternate host. It has spindle shaped lumps and produces orange spores in the spring and is spread by the wind in March & April. Willow, laurel, and water oaks are especially at risk at this time because they are producing new leaves that the wind blown spores are drawn to. This fungus will not kill the tree immediately, in fact, the fungus can continue to grow for many many years beforehand. If you have noticed any of these symptoms on your trees in Watkinsville, it is best to contact a Certified Arborist for a free assessment and disease diagnostic. These are typically free and could potentially save your beloved tree. At North American Tree Service we typically recommend heavy pruning of the area, if possible followed by a spray regiment to keep the tree healthy. Call us today for a free estimate! How to Get Rid of Sweetgum Droppings For Good! In fall, all we want to do is be barefoot in our yards, lay back and enjoy the sunshine and cool weather. However, if you have sweet gum trees in your yard, think again! These beautiful trees come with quite the drawback. Every fall they drop a heavy amount of spiky balls all over your lawn. But wait! That’s not all, they also continue dropping these pesky things over fall and winter up until early spring when the new leaf growth emerges. These spiky nuisances will tear up your lawn mower, resulting in having to pick them up by hand, ouch! The specific application that we use to apply to sweet gum trees must be applied in a very short window, otherwise will not work. These injections need to be made just before it flowers in spring. This gives our Arborist’s about a week time frame to get the application on to prevent the balls from dropping all year. When choosing a professional tree service, make sure they have ISA Certified Arborist’s on staff to assist you. Tree health care and pesticides must be monitored very closely and performed at the perfect time, as the wrong application or too much of the right one can be deadly to your American Sweet gum. The only downfall to these treatments is that they will need to be done yearly, to prevent the balls from returning. If you need assistance removing a sweet gum to replant something that fits your maintenance requirements a little better, we can help! Give us a call today for a free estimate on growth regulators, removal, or replanting. In the tree care industry it is easy to mistake a reputable company for one that has all of its certifications, and is also licensed and insured. It is important to carefully select the company that will be working on your property because if they are not insured, you could be liable for any damage or injuries that occur on your property. Some homeowners are just looking to save a couple bucks by paying the less reputable companies cash, however they quickly find out it ends up being much more expensive. In addition to the risk of being liable for any injuries and damages, the lower scale tree companies will not have as much experience or the resources as the higher level companies. Having a certified Arborist on staff is also a very important thing that homeowners should consider while choosing the right company. If a company’s sales team has no background in tree service or tree care, how would they even be able to properly diagnose your beloved trees? Unfortunately, it there has been many instances that we have arrived to an estimate only to find hundreds of trees that are alive and well marked up with orange paint signaling the removal. Every day companies of all kinds go out to estimates and tell homeowners trees should be removed just to pocket the money. This is simply unjust. Saving the tree is always our priority. Removals only occur based on the homeowners preference or if the tree is completely dead and cannot be healed. So how can you protect yourself and your home? An insurance certificate dated for a full year of coverage can be easily obtained with one down payment. Don’t settle for a piece of paper. Call the insurance company directly to verify CURRENT coverage. Liability and especially worker’s compensation insurance in the tree care industry is very expensive. It is also required by law. This is the dividing line between a professional tree service company and a “fly-by-night” operator. An uninsured tree care company often provides the lowest estimate, but at what cost to you as the homeowner? Ask for a list of references from local satisfied customers and BE SURE TO CALL. Tree trimming and removal involves the use of chainsaws and chippers and is extremely dangerous. Ask about the use of safety equipment (hardhats, chaps, safety glasses, etc.). What are their policies about drugs in the workplace? Ask for and verify professional affiliations the company might have, such as membership in the International Society of Arboriculture (ISA) (toll free 1-888-472-8733) or the Better Business Bureau. Sell jobs without producing a written estimate or work order. Offer prices good only for immediate service. TCIA Members - TCIA (Tree Care Industry Association) is a respectable accredidation program that requires companies and employees to carry a certain set of standards through tree care to become members. They are dedicated to educating homeowners of the proper care of trees and training employees to incorporate safe business practices. They have been striving to improve the tree care industry since 1983. ISA Certified Arborist’s - To become an ISA Certified Aborist, you must be extremely knowledgeable in every area of arboriculture. You must also have a minimum of three years work experience in the industry, as well as a degree pertaining to any field of arboriculture. To be ISA Certified, you must take a very long extensive test that requires dedication and months of studying. At North American Tree Service, we have been licensed and insured with workers compensation since we started back in the 90’s. We have a staff of certified Arborist’s who can properly diagnose and treat your trees the correct way. We have always put the homeowner and our employee’s safety first, as this is a very dangerous line of business. Our employees and customers feel safe knowing that if any injuries happen while on site, everything will be completely covered by us. If you have trees on your property in Athens, Georgia, eventually they could be subjected To disease or decay for a number of reasons. While sick trees can be a pest, it is very important that you call North American tree service to assist you before the problem becomes bigger. The longer the decay continues, the more dangerous the tree becomes. One of the main problems caused by dead and dying trees on your property, is the potential housing for a number of pests and creatures. Termites can actually invade a tree and eventually make its way to your home if it is close enough. This can cause some major damage and can easily be prevented by calling a tree care service in Athens, Georgia. We have a staff of certified Arborist that service Athens and surrounding areas Providing free estimates for you and your property. One of the most unsettling issues with dead or dying trees is when they have an actual target underneath them. They target consist of cars, houses, Burns, shades, a dead or dying tree on your property will not show any mercy to any of your belongings underneath. Also, storm damage tree removal is much more costly and dangerous than removing the decayed tree in the first place . North American tree service also helps our customers in Athens Georgia by providing fertilization to the trees that are or could be diseased or damaged. This provides an opportunity for the tree to actually repair itself before completely removing the tree. Another problem is if the tree is leaning towards a neighbors house. Any tree on your property in Athens, Georgia is your responsibility to maintain. If your tree is leaning towards your neighbors house, and decides to fall and hit anything in their yard, you will be 100% liable for the damages caused by that dead or dying tree. In Georgia or weather is very much unpredictable. This season we have gotten an absurd amount of rain that was very Unexpected. The problem with all this rain, other than septic tank issues, is when the rain overloads the soil and causes it to become extremely soggy. Dead and dying trees hate soggy soil because it prevents their root systems from being able to hold And distribute weight evenly. What this means is that One heavy rainfall could result in a tree uprooting and landing on your home, or any of your other valuables underneath. Unfortunately, it happens more often than not and is much more expensive than dealing with the problem when it first arises. If you have any dead or dying trees please give us a call today! If you suspect that a tree on your property is disease it is very important that you take care of the problem immediately. There are some diseases that can actually in fact all of your other trees and leave you with a much larger problem. Disease, decade, or sick trees need Attention immediately. This is why you should contact a professional, reliable, tree service that services Athens Georgia and surrounding areas for a free estimate by one of our highly educated certified Arborist on staff. The estimate is 100% free, so there is no reason to wait until the problem is much more extensive. Call us today for a free estimate! Benefits of Fertilizing your Trees. Unfortunately, soil is not a ”one size fits all” thing. 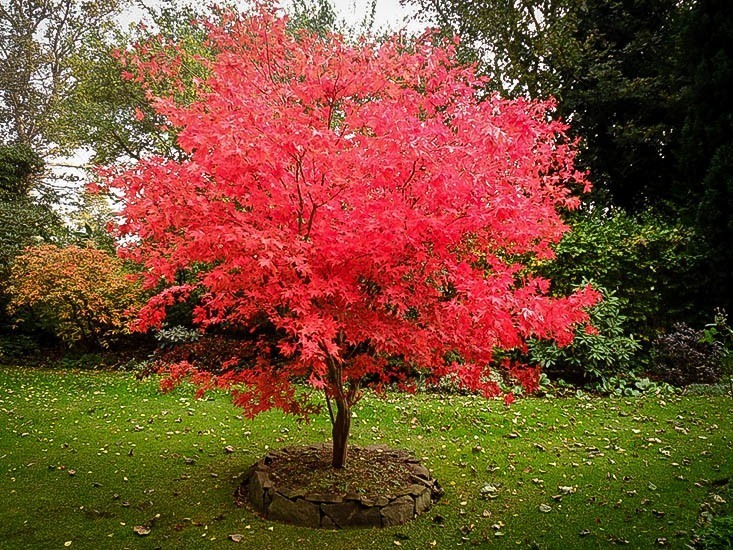 It contains many different elements and minerals such as boron, chlorine, cobalt, copper, iron, manganese, magnesium, molybdenum, sulphur and zinc that are vital to the health and survival of your trees and shrubs. At North American Tree Service, we always have our certified technicians take a proper soil test to determine exactly what your soil is lacking and where it can improve. This way, we avoid adding too much of the wrong element to the soil, which could end up killing the tree! This is why it is so important to make sure you hire a certified arborist to asses your trees. We have four certified arborists on staff that are prepared to diagnose your tree and make a plan to keep it healthy! While unfortunately this isn’t always the case, usually a deep root fertilization done by a certiifed technician on a tree that looks sick or unhealthy, can sometimes reverse the effects and bring it back to life! By providing the tree with a maximum amount of nutrients, it can help the tree to become strong enough to completely fight off some infections. Now while fertilizer is a great thing for a dead or dying tree, it can also maximize the problem and kill the tree if the wrong type of fertilizer is used. North American Tree Service has a staff full of tree care industry experts that are able to determine exactly what route to take when deciding what type of fertilizer is safe and should be applied to your tree. By making the initial decision to fertilize your trees, you were actually making a long-term decision to not have to remove them. This in turn will save you money as tree removal is much more costly and dangerous than tree fertilization. We recommend our customers get ahead of the problem before it starts by contacting one of our certified arborist today for a free estimate on any of your tree care needs. Fertilization can help strengthen the roots of the grass in your yard, allowing them to absorb more water more quickly preventing large mud holes every time it rains. If you have an area in your yard where the water just seems to collect every time it rains, you might want to do a fertilization just to prevent any further soil damage or potential root root for the trees! Did you know heavy rain is the most dangerous element for a dead tree? Even a tree that looks completely healthy on the outside could be hollow all the way up. This means as soon as it rains, especially if you have water collecting at the base of the tree, it could cause it to uproot completely. Give us a call today if you have any questions about the trees in your yard and are located in any of our service areas listed below. One of the most difficult things about landscaping is figuring out what your going to plant and where. The best advice ever told is “don’t plant trouble”. That means, no trees too close to the house that will eventually have to be removed by a qualified tree expert. Also, checking the type of tree and what it needs is a must. Otherwise, you might plant a bristlecone pine in the middle of Ga. and call us wondering why it hasn’t grown an inch and looks dead. We are in hardy zone 8 which means we have very high heat and high humidity as well. A soil test is a good idea before planting anything, just to make sure it will thrive in that specific soil. But, if thats too much of a hassle, we have listed out five of the best trees to grow in Ga. for curb appeal, no soil test necessary. Japanese Maple - These beautiful trees are often found as the focal point in landscapes. Though they are a bit slow growing, only 1 to 2 feet per year, it will be worth the wait. They have many different cultivars so it is important to do your research on which kind you like. They also have dwarf varieties that are a little more like a shrub, and are great bonsai specimen. 2. 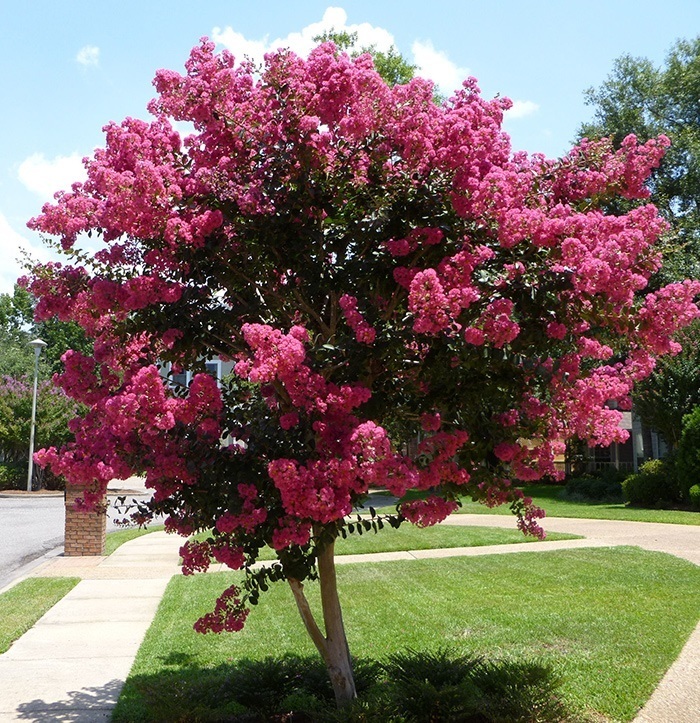 Crepe Myrtle - Another beautiful species offering showy flowers in summer along with a great fall color. They are truly a great year round tree. These look great placed closer to the house but always 10 feet distance, along with some yearly pruning. 3. Red Maple - Another member of the maple family, they are one of the most beautiful trees that have a display of red through all the seasons. Though they are very common, they are known for their buds in winter, flowers in spring, leafstalks in summer, and bright, beautiful foliage in autumn. 4. Magnolia - Often used as a privacy tree, as they grow up to 80 feet tall and 40 feet wide, these trendy trees are a great addition, when properly planted and spaced away from the house. There is something to love about these trees in every season. Even in winter, they hold their dark, shiny green leaves until late spring, when the beautiful fragrant white flowers emerge. 5. Weeping Cherry - Something about weeping trees is just so calming for the landscape. Weeping willows prefer lots of water, so we chose the weeping cherry instead. They grow about 20-30 feet and bloom bright pink or white blossoms during spring. After the blossoms fall, the dark green leaves shower the tree until late summer. Whether they are indoor/ outdoor plants or trees, they are all very susecptible to all different kinds of diseases. The good news is that if you can identify the issue as it is just beginning, we can most likely get one of our arborist’s to come out and fix the problem. There are quite a few of the more commonly seen diseases, listed below. Oak Wilt - Also known as Bretziella fagacearum or Ceratocystis fagacearum. This problem can spread very easily between healthy trees. It is most commoly seen in red and white oak trees. There are many symptoms, though the easiest way to tell is the shedding of all leaves. The leaves on live oaks will have yellow veins that eventually turn brown. appearances An important thing to remember when trying to avoid oak wilt is to avoid pruning these trees between April 15 - July 15, this will greatly reduce the chance of your tree contracting this disease. If you have any questions about the health of your trees or notice leaves dropping out of its regular dormant period, please don’t hesitate to contact us! Sooty Mold - This usually affects the ornamental plants such as your azaeleas, crepe myrtles and laurels. Black spots will cover the leaves and trunks of the trees it has infected. However, even though it looks like something terrible, it usually does no harm to the plant its feeding off of. Usually just a cosmetic issue, but sometimes it can cause the trees leaves to yellow up or block the sunlight from getting to the tree. 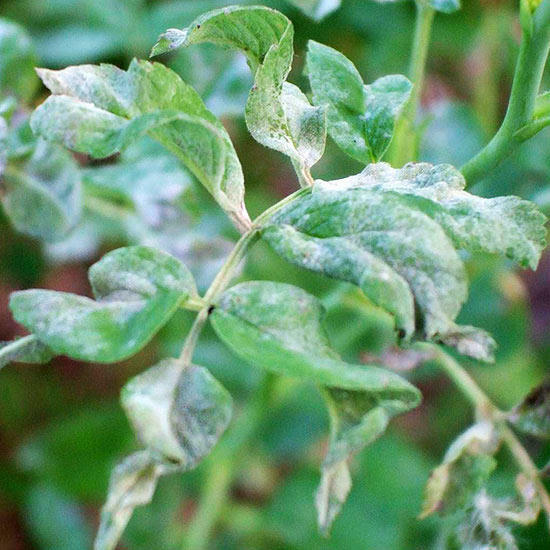 Powdery Mildew - A powdery, white coating on the leaves of its host, this fungus loves high humidity and lots of shade. Unfortunately the only way to prevent it is to choose resistant varieties. Eventually the leaves will be distorted, turn yellow or red and drop. These are just a few of the diseases that can affect your trees and shrubs. There are many, many more that can have much worse symptoms, so if you notice anything funky going on with your trees, be sure to give us a call for a free estimate by one of our certified arborists!